1506, formerly El Paso City Lines 1506 and originally San Diego Electric Railway 512, operates a test trip on the “upper loop,” coming down the hill from the university area on North Oregon Street at Nevada where traditional streetcars, but not PCCs, once operated. 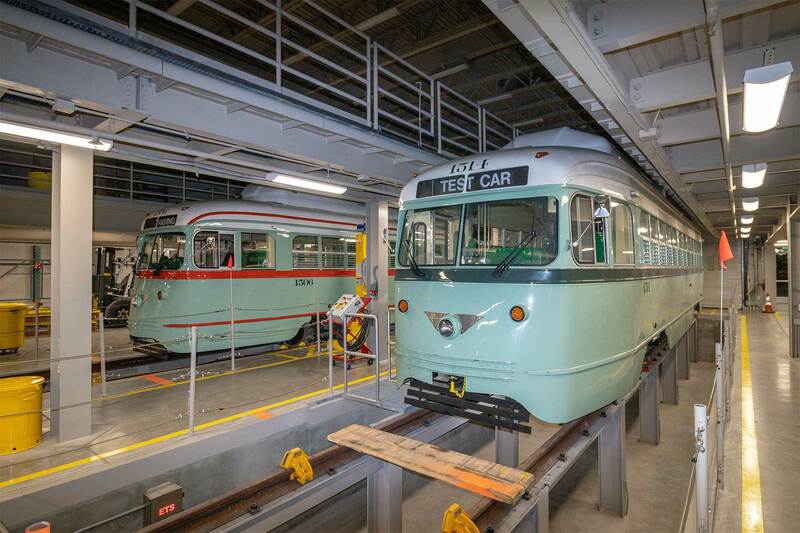 Cars sporting two of the three El Paso streetcar paint schemes in the new maintenance facility on South Santa Fe. Night testing of each car goes back to June 2018 when the overhead was first energized. Both the upper and lower loops are used for testing. Here 1504 is performing starting and stopping on the Stanton hill, which just below Schuster Street, provides the highest gradient on the system, 5.8 percent. The lower loop is almost completely flat. For its 2019 Annual Convention, the Electric Railroaders’ Association resumes visiting new light rail and streetcar systems that have opened since the turn of the millennium. We will visit three transit hotspots of the South and Southwestern U.S. for the first time — Tucson and Phoenix, Arizona, and El Paso, Texas — all lauded by acclaimed urban planner Christof Spieler in his book Trains, Buses, People: An Opinionated Atlas of U.S. Transit. Tucson, Phoenix and El Paso designed their urban rail systems as integral parts of their regional surface transit, linking each city’s major business, retail, educational and entertainment districts. The ridership of Tucson’s vibrant transit system approaches that of bigger cities such as Miami, Pittsburgh and Denver; ridership of both El Paso and Phoenix exceed that of bigger cities such as Atlanta and Dallas. Clearly, these exciting new systems are not mere tourist curiosities. For August 31 through the morning of September 2, our convention will be based in Tucson, a picturesque, mid-size city. Tucson features restorations of historic Old West buildings as well as innovative new districts inspired by the Old West which have sprung up along the 3.9-mile Sun Link streetcar line. Convention attendees should plan on checking in Friday, August 30 because our first activity begins at 8 AM the following morning. September 2 features a trip on Amtrak’s Sunset Limited from Tucson to El Paso, Texas. We have chartered a train car primarily for members. Your booking will include bus transfers between hotels and train stations both in Tucson and El Paso. We will arrive in El Paso in the afternoon of September 2 and stay through September 3. We close our visit with the Annual Banquet at the DoubleTree by Hilton, Downtown El Paso hotel, our El Paso Headquarters. Carl Jackson, who managed the construction and launch of the El Paso Streetcar, will be our keynote speaker. Convention attendees should plan on checking out the following morning on Wednesday, September 4. Following our visit to the Arizona Railway Museum, sufficient time will be provided to have lunch and ride Valley Metro Rail, a 26.3-mile light rail line serving Phoenix, Tempe and Mesa with a one-way travel time of over an hour. A free day pass will be provided by the ERA for attendees to ride and photograph the entire line, including a stop at 44th and Washington Streets that features a free connection to Phoenix Sky Harbor International Airport on the PHX Sky Train people mover. Another popular tourist destination is Biosphere 2 at the University of Arizona. We will reconvene at a convenient meeting point by 5 PM for the return trip to our Tucson hotel. Enjoy Tucson restaurants and nightlife on your own, either immediately adjacent to the hotel or along the Sun Link streetcar line. Sun Link operates until midnight on Saturday. Trolley barn, 90 feet of operating track, and streetcar collection. The Southern Arizona Transportation Museum at the restored Southern Pacific depot downtown, which also functions as the Amtrak depot from which we depart for El Paso on Monday. This facility focuses on railroad history and has the SP locomotive 1673 on display which was built in 1900. The new Transit Museum and shops that feature streetcars and buses, with a focus on the types of transit vehicles used in Arizona. The balance of the streetcars is displayed there. Our chartered motor coaches will drop members off in one of the numerous restaurant hubs along the Sun Link Streetcar. Members can ride and photograph the streetcar with an ERA-provided day pass. Sun Link, also known as the Tucson Streetcar, is a single-line streetcar system that began service in July 2014. The line connects the emerging Mercado Shopping District, Historic Fourth Avenue and the historic downtown with the University of Arizona and the Main Gate Square shopping and entertainment district. The Tucson Streetcar, University of Arizona and Main Gate Square are all just steps from our headquarters at the Tucson Marriott University Park Hotel. At 7 PM at our Tucson hotel, we will enjoy a program of Arizona traction presented by Gene Caywood, president of Old Pueblo Trolley. Mr. Caywood’s slideshow will cover a history of streetcar lines in the five major Arizona cities, focusing on the two largest operations in Tucson and Phoenix. He will also discuss the history of Old Pueblo Trolley, including their startup, how they operated for 17 years, and future plans. A bright and early start this morning! We have arranged for our breakfast to be served at 5:30 AM. Allow time to check out and board one of our two chartered buses to the Tucson Amtrak station. Make sure you are on one of these two buses! The first bus trip departs at 6:45 AM, the second at 7:15 AM. We’ve budgeted extra time to allow for orderly check-in of our group. For maximum room in our chartered train car, we urge checking of all large pieces of luggage to the baggage car (included in your fare). While our double-deck Superliner coach has a baggage compartment on the lower level, they are unlikely to have space to store all our luggage. If you cannot ascend the steps to the upper level and require lower level accommodation, please indicate that in your order form. The balance of the group will be seated on the upper level of the train car. Our train will be Amtrak’s train no. 2, the Sunset Limited, which departs Tucson at 8:15 AM and arrives at El Paso Union Depot at 3:15 PM. Members may enjoy meals in the dining car (with on-board reservations on a space available basis) or snacks and sandwiches in the café car. On-board meals and snacks are at your own expense. In El Paso, a chartered bus will make two trips to transport members from Union Depot to the DoubleTree by Hilton Downtown El Paso Hotel. Your ERA booking includes Amtrak train fare, all bus transfers and all tips. Bus transfers and luggage handling account for the fare being higher than basic Amtrak fare. If you do not book the ERA chartered car and later change your mind, you will pay a surcharge to cover bus transfers and luggage handling. Make sure to read the Logistics section on instructions for traveling by Amtrak. The ERA will distribute the El Paso day passes on the train, which you can then use as your ride around El Paso on September 3. Use your extra time in El Paso on September 2 to ride the El Paso Streetcar (until 7 PM closure) or enjoy the shopping and dining opportunities in downtown El Paso’s El Centro or Union Plaza districts. El Paso, Texas’s fifth largest city, is our final destination. 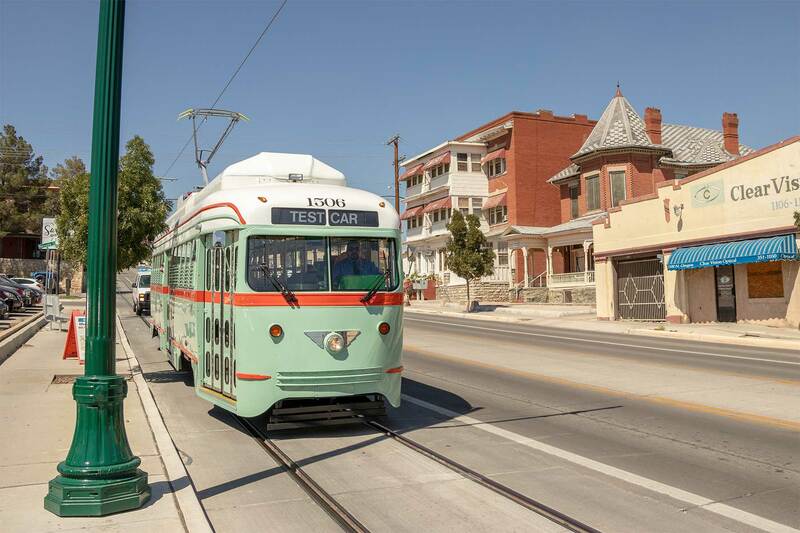 Members will receive an ERA-provided day pass to ride at-will on Sun Metro’s El Paso Streetcar. The new system, which opened on November 9, is a 4.8-mile line with upper and lower loops. It connects the University of Texas at El Paso (UTEP) with Downtown El Paso and the lower Second Ward with convenient connections to Sun Metro’s bus network. 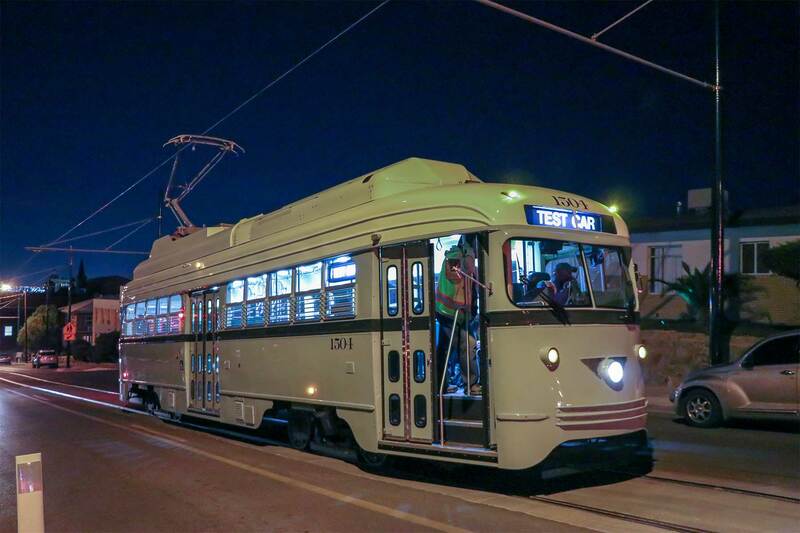 The El Paso operation is unique in employing the only rebuilt pre-war PCC streetcars anywhere in the world. These are the same streetcars which provided service on the only North American international streetcar line between El Paso and Ciudad Juárez, Mexico, from 1902 until its 1974 system closure. For more information, see “El Paso Returns to its PCC Roots” by John Pappas in the 2018 issue of Headlights. We will arrange a meeting time for a tour of the shops where these rebuilt pre-war PCC streetcars are maintained. For those who want to take a break from riding streetcars, downtown El Paso features three districts of interest: Union Plaza, with bars, restaurants and other nightlife near the historic 1906 train station; the Las Plazas Arts District; and El Centro, El Paso’s original shopping district. Stretching all the way to the Mexican border, El Paso Street is the heart and soul of El Centro. With its rich history and open-air shops, the street is well known as a vibrant, multi-cultural shopping area serving both Mexican and United States shoppers. If you still have time and energy in the afternoon, feel free to walk over on your own to El Paso Union Station (also the Amtrak depot). The station is a 12-15-minute walk from the hotel. The early 1900s station was designed by the great American architect Daniel Burnham, who also designed Washington Union Station. Two blocks away is restored Locomotive No. 1, a classic American 4-4-0, and a dozen exhibits on El Paso railroading and urban traction. Eight railroads operated into El Paso in the 19th century. ERA’s Annual Banquet will be held this evening at the DoubleTree Hotel. The cash bar will open at 6:30 PM in the 17th floor rooftop Sky Lounge. Dinner will be served beginning at 7 PM in the rooftop Franklin Ballroom. Both rooms feature breathtaking views of the El Paso skyline. Texas hospitality and the lower prices of this region allow ERA to offer filet mignon as a dinner entrée option for the first time. Our guest speaker will be Sun Metro’s Carl Jackson, assistant director of streetcar operations for Sun Metro, which operates the El Paso Streetcar. Mr. Jackson was in charge of construction, testing and launching of the streetcar line. The centrally located Tucson Marriott University Park Hotel is a 1-minute walk from the nearest Tucson Streetcar stop, and adjacent to both the University of Arizona and the Main Gate Square entertainment, shopping and restaurant district. From the streetcar stop, restaurants and shopping in both Downtown Tucson and the historic 4th Avenue district are no more than a 5- to 10-minute streetcar ride away. The ERA has secured a block of rooms at the discounted rate of only $120 plus 12.05% occupancy tax and $4 tourism fee per room per night (either one king bed or two queen beds for up to two guests) available for the nights of August 31, September 1 and 2 with checkout on September 3 (plus three days before and after these dates, at hotel’s discretion based on availability). Online: Use this hotel’s Special ERA Link to book your room: Using this URL will automatically bring up the discounted rates of $120 per night (plus tax) for rooms with one king bed or two queen beds. To obtain these discounted rates, please book as soon as possible. You may pay with Marriott Reward points. The room rates are available for the nights of August 30, August 31 and September 1 with checkout on September 2 (plus three days prior and after these dates, depending on availability). By phone: Book your reservation either by calling Marriott national reservations at 800-453-0309 or directly with hotel at 520-790-4100 (ask for “reservations”). Mention the “group reservation under the Electric Railroaders’ Association” rate when calling to get the $120 per night room rate. Cut-off date for discount rate: These discounted rates expire after July 30, 2019. Further offers of the discount rate after July 30 are at hotel’s discretion on a space available basis. Check-out Time: 12 noon on day of departure. Room cancellations must be received no later than 48 hours prior to check-in (6 PM) for refund at either hotel. Your cancellation number MUST be obtained to ensure refund. All succeeding reservations will be automatically cancelled by the system if guests fail to check-in on the first arrival date and the first night will be charged on the credit card provided with no refund. Note: If you can’t make the first night of your visit, but can make the other nights, call the hotel immediately to preserve the rest of your reservation. The high-rise DoubleTree El Paso Downtown is conveniently located to the local Sun Link Streetcar, less than five minutes to either the southbound Oregon or northbound Stanton Street service. The streetcar serves major downtown destinations and also the University of Texas at El Paso. Significant local dining opportunities are offered both at the hotel and within a 10-minute walk. The ERA has secured a block of rooms at the discounted rate of only $115 plus 17.5% sales and occupancy tax per room per night (either one king bed or two queen beds for up to two guests, $120 for three guests) available for the nights of September 2 and 3, with checkout on September 4 (plus three days after these dates, at hotel’s discretion based on availability). Prisma Tours departs from the DoubleTree Hotel and offers customized individual or group tours of Downtown El Paso at daytime or evening, Juarez (Mexico) as well as nearby scenic Las Cruces, Alamogordo and Carlsbad, New Mexico (by request). Email Prisma Tours at prismatours/juarezelpaso@gmail.com or call 915-343-4744 for additional information. The Outlet Shoppes of El Paso mall is 13.5 miles away and can be reached by the free Outlet Shoppes shuttle. Online: Use this hotel’s Special ERA Link to book your room: Using this URL will bring up the discounted rates of $115 per night (plus tax) for rooms with one king bed or two queen beds. To obtain these discounted rates, please book as soon as possible. You may pay with Hilton Honors points. The room rates are available for the nights of September 2 and 3, checkout on September 4 (plus up to three nights to September 7, depending on availability). By phone: You can also book your reservation either by calling DoubleTree reservations at 800-445-8667, or directly with the Event Manager at 951-342-1404. Mention the three-letter reservation code “ERA” or “group reservation under the Electric Railroaders’ Association” room block when calling to get the $115 per night room rate. Cut-off date for discount rate: The cut-off date for reservations is Friday, August 3, 2019, OR when our room block has been fully booked, whichever occurs earlier. Reservations booked after August 3, will be accepted by the DoubleTree at the hotel’s discretion based on availability and rate. The number of seats available for the Amtrak group trip is limited to 60 people. If and when we sell out, no more seats are available for the group ticket. There will be no exceptions. Due to Amtrak’s pricing schedule, if you want to travel with the ERA group from Tucson to El Paso, we must receive your ERA booking including Amtrak by May 24, 2019. Once booked, the Amtrak portion is nonrefundable. If you choose to travel independently, you will be responsible for purchasing a ticket on your own through Amtrak and arrange for transportation to and from the train stations, or travel on the ERA buses at an extra charge. Alternatives to Amtrak include Greyhound, driving or flying. As with airline travel, Amtrak requires each passenger to carry government-issued photo ID such as a driver’s license or passport and present it on demand. Don’t forget to take this with you. Weight and size of checked baggage must not exceed 50 lbs. (23 kg) or outside linear dimensions (length + width + height) of 75 inches (190 cm). From Tucson International Airport: The airport is 8.5 miles from the hotel. A taxi or ride-hail trip can be completed in 15-30 minutes. The hotel can be reached in under 90 minutes using Sun Tran bus route 25 and transferring to routes 1 or 6 at Broadway and Euclid. Take either bus routes 1 or 6 to Euclid and University and walk one short block east to the hotel. From Tucson Amtrak Station: Walk about 5 minutes southeast along Toole Ave. (the street in front of the depot) to the Plaza Centro streetcar stop. Then take the Sun Link Streetcar to University/Tyndal Station. Hotel is one block away. Total trip requires less than 20 minutes. Note: If you have large or heavy luggage, ERA recommends taking taxi or ride-hail services from either the Amtrak station or Tucson International Airport. The DoubleTree hotel offers complimentary shuttle service to El Paso International Airport or the Amtrak Depot. Reservations are required (call 915-532-8733). Scheduled ERA event times and Amtrak service shown in this flyer are subject to change in the final itinerary or during the trip without prior notice. Daily trip itineraries may be changed without prior notice to ensure on-time return at the end of each day. Announcements will be made each day to update guests on essential information during all ERA events. Providing your phone number (and email address) on your registration form is critical. If you have questions regarding the itinerary or accommodations, please e-mail Bob Newhouser at bnnyc1955@aol.com or call/text him at 917-482-4235. E-mail is preferred.